Although electromagnetic waves exhibit many characteristics and properties of waves, they can also exhibit some characteristics and properties of particles. We call these "particles" photons. Because of this, we say that light (and all EM radiation) has a dual nature... at times it acts like a wave, and at other times it acts like a particle. 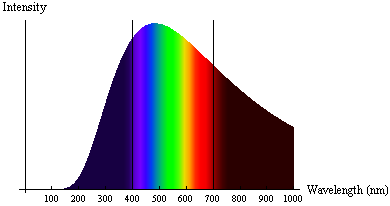 Characteristics of light that indicate light also acts as a particle include Blackbody Radiation, the Photoelectric Effect, and the Compton Effect. The radiation emitted from a very hot object (known as black-body radiation) didn't align with physicists' understanding of light as a wave. Specifically, very hot objects emitted radiation in a specific spectrum of frequencies and intensities, which varied with the temperature of the object. Hotter objects had higher intensities at lower wavelengths (toward the blue/UV end of the spectrum), and cooler objects emitted more intensity at higher wavelengths (toward the red/infrared end of the spectrum). Physicists expected that at very short wavelengths the energy radiated would become very large, in contrast to observed spectra. This problem was known as the ultraviolet catastrophe. German physicist Max Planck solved this puzzle by proposing that atoms could only absorb or emit radiation in specific, non-continuous amounts, known as quanta. Energy, therefore, is quantized - it only exists in specific discrete amounts. For his work, Planck was awarded the Nobel Prize in Physics in 1918. Further evidence that light behaves like a particle was proposed by Albert Einstein in 1905. Scientists had observed that when EM radiation struck a piece of metal, electrons could be emitted (known as photoelectrons). What was troubling was that not all EM radiation created photoelectrons. Regardless of what intensity of light was incident upon the metal, the only variable that effected the creation of photoelectrons was the frequency of the light. The value of h, known as Planck's Constant, is given as 6.63*10-34 J•s. Einstein proposed that the electrons in the metal object were held in an "energy well," and had to absorb at least enough energy to pull the electron out of the well in order to emit a photoelectron. The electrons in the metal would not be released unless they absorbed a single photon with that minimum amount of energy, known as the work function of the metal. Any excess absorbed energy beyond that needed required to free the electron became kinetic energy for the photoelectron. The animation below demonstrates a high-energy photon of light being absorbed by an electron in an atom. Because the photon has an energy greater than the energy holding the electron to its nucleus, the electron absorbs the photon and is emitted as a photoelectron. The kinetic energy of the emitted photoelectron is exactly equal to the amount of energy holding the electron to the nucleus subtracted from the energy of the absorbed photon. This theory extended Planck's work and inferred the particle-like behavior of photons of light. Photoelectrons would be ejected from the metal only if they absorbed a photon of light with frequency greater than or equal to a minimum threshold frequency, corresponding to the energy of a photon equal to the metal's "electron well" energy for the most loosely held electrons. Regardless of the intensity of the incident EM radiation, only EM radiation at or above the threshold frequency could produce photoelectrons. Question: What is the energy of a photon of light traveling through space with a wavelength of 6×10–7 meters? Question: The spectrum of visible light emitted during transitions in excited hydrogen atoms is composed of blue, green, red, and violet lines. What characteristic of light determines the amount of energy carried by a photon of that light? Answer: (2) frequency determines the energy carried by a photon. Einstein continued to extend his theories around the interaction of photons and atomic particles, going so far as to hypothesize that photons could have momentum, also a particle property, even though they had no mass. In 1922, American physicist Arthur Compton shot an X-ray photon at a graphite target to observe the collision between the photon and one of the graphite atom's electrons. 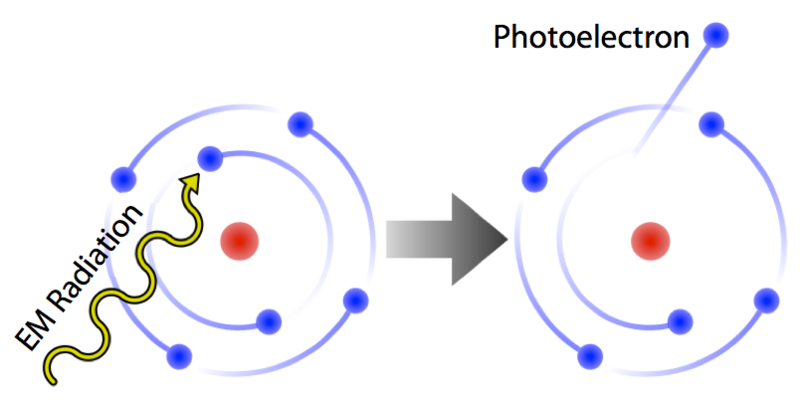 Compton observed that when the photon collided with an electron, a photoelectron was emitted, but the original X-ray was also scattered and emitted, but with a longer wavelength (indicating it had lost energy). Further, the longer wavelength also indicated that the photon must have lost momentum. A detailed analysis showed that the energy and momentum lost by the X-ray was exactly equal to the energy and momentum gained by the photoelectron. Compton therefore concluded that not only do photons have momentum, they also obey the laws of conservation of energy and conservation of momentum! In 1923, French physicist Louis De Broglie took Compton's finding one step further. He stated that if EM waves can behave as moving particles, it would only make sense that a moving particle should exhibit wave properties. De Broglie's hypothesis was confirmed by shooting electrons through a double slit, similar to Young's Double Slit Experiment, and observing a diffraction pattern. The wavelength of a moving particle, now known as the De Broglie Wavelength, is given by: . Answer: (3) moving particles have both particle and wave properties. Answer: (4) Wave-particle duality is most easily observed in small objects.